Just remember that it doesn't fish like any other lake around here! I went to a BASS event there and every angler there literally said it wasn't like any other lake they had fished. Well, unless you were from around here. Yea, and I was hung over the next morning when we went back upstream. My head was throbbing after the first skinny water where we had to push! 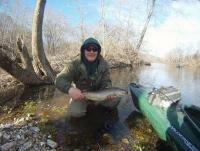 Had a friend with a 16' aluminum john and that was a female doggy to get back upstream. We took it downstream to a fishing spot thinking there would be enough water to run it back up, but man were we wrong. Not an easy job I thought. Great job! Glad to see them still biting even in this cold. Now the crappie are on fire! Good time to be on Grand or the rivers going into it. Yep, that smell was bad! Glad you had a good time in Okie land. I swear that lake has more crappie, cats, spoonbill, and whites than any other I have fished around. Those are some nice slabs you were catching. I guess crappie and morels are for dinner? I had heard from a kid at work who fished the Neosho on Sunday that it had gone down at least a foot or so. I would think the Spring has gone down as well. Hope that helps some. That sounds about right as far as what I have heard in the last couple of days as well Wily. Poor guy saved her life and lost his not even knowing her. That is a true hero in my books. Yes, . Crazy I thought the same. Generous limits on the lake for many different species. Jamie, were the gravel bars covered from the last rain above the bridge? I caught some from there the other day. I got in about 3 hours today just upstream from the old bridge. Wasn't really sure about the rain and saw where people were wading and catching so that is what I did today. Put on the waders and went out. Caught four nice ones but they came in the same hour so after that it wasn't very impressive. Not a great day though with the storms moving through. I did see some fish being caught. Caught mine on a fluke and crankbait. Ok, yes, they didn't jump like a slim rocket! Geez man! You could see them everywhere though. Ok, so I will dish out the scoop for everyone. I went yesterday morning to wade fish. First mistake of the day for sure. I had thought about bringing my canoe and paddling upstream, but when I saw the cfs rate I decided against it. That would not have been an issue after I was on the water and saw I could have coped with it. It was a mistake because everyone I saw catching them were on the bluff side under the house. I couldn't quite get over that far with the spinning rod. Up above where the water comes around the corner was moving fast and there were no eddies or anything to hide behind for them until a little further downstream. I saw all kinds of white bass jumping everywhere. I didn't see anything large getting caught however. Most looked to be small males. Now I did get to see a couple of nice stringers from boats, but they both told me those were caught between McCords and Blunks. So in other words it isn't ready to explode just yet, but very soon! Also talked with a guy who said he tore them up on Friday, went back on Saturday and didn't get a bite. I sure stunk as well! Ended up catching a small one and that was it. I feel for you Snagged since I gassed up and traveled about an hour to get there. I thought it was going to rain for sure since they were talking about a 60% chance. If I had known that I would have went to Okie land and tried my luck. Much closer for me. Like anywhere else, if they are on fire you can catch them, but it wasn't the case yesterday. I can definitely say though that they are in there and on the move. Good lord, I forget how crowded that river can get when the run starts.